After a great window of high pressure, last week brought two and a half feet of new snow to the top of Turnagain Pass. Waking up in the morning dusk, we followed the old mining road up the creek. 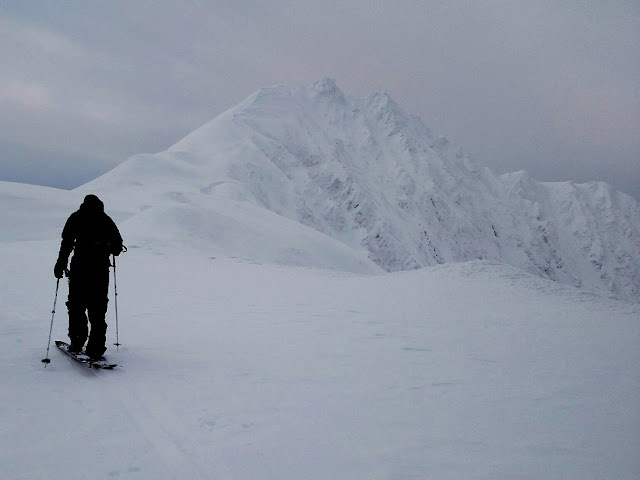 By the time we reached the upper basin, there was a foot of new snow sitting on a settled base. 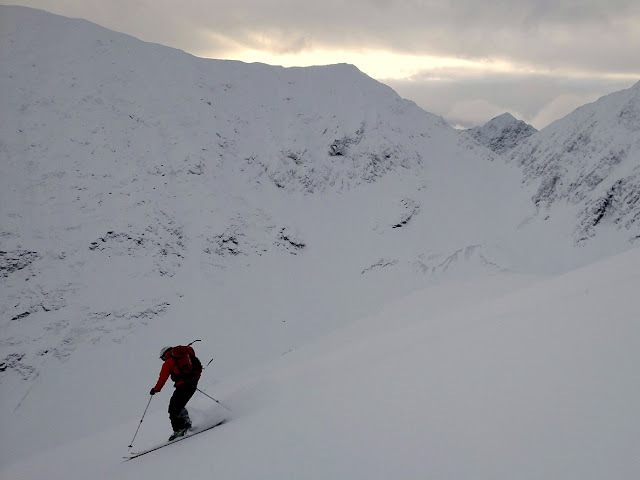 Wanting to take advantage of the new snow, but to avoid the danger associated with a thick slab we headed to the southern end of Turnagain Pass. Avoiding potential avy danger, we followed the north ridge towards the summit. Andalyn with one of my favorites, TT43. As storms flow through Portage and turn south towards Turnagain Pass, they drop the majority of their moisture as they rise over the pass. Slightly shadowed by the pass proper, Silvertip would be a good mix between soft and stable. Following the ridge brought the bite of the cold easterly winds that were ushering in the next storm. Photo: Khalial Withen. Looking south towards Juneau Creek, funny to think that the Summit Lake zone is just a stone's throw away. Out of the punishing winds of the ridge and off the face we stopped for lunch in the huge basin. Between bites of pizza and smoked salmon, Zack and I vehemently defended the benefits to moral fiber of alpine starts. With the forecast blizzard beginning to move in, it was time for the crew to point our the skis towards home.